You’ve been cordially invited to a one night one of a kind experience in the Ivory Tower of Karazhan. Medivh and all of your favorite Heroes will be there (and maybe you can even bedazzle one of those cute Medivas walking around). However, when you show up, things are not as expected. You walk into the Parlor to see if Moroes needs some help, but by the evil looks you’re getting from that Deadly Fork, it’s not going to be an easy task. Welcome to Karazhan and welcome to our NUEL coverage of the adventure. If you enjoyed our last feature series on the League of Explorers, you’ll have an idea what this is about. This time however, we are going to take a look at the cards week by week as they come out to give you an idea of what new cards to expect to see in your NUEL tournament play as well as the feature legendary every single week. In this list, we will focus on the cards released this week most expected to make an impact in the Conquest tournament format listed in order of expected impact. Note that this is not set in stone and may differ drastically from your own personal opinion. If that is the case, please kindly jot down your thoughts in the comments below and add to the discussion. Now, let’s jump right into the excitement of the party. Protect the King – Expectation Score: 10/10. Unleash the Pawns! For 3 mana, you can protect yourself from an impending assault on your face or your board next turn and force your opponent to run his minions into worthless 1/1 Taunts or use a premium board clear. After all, it doesn’t matter that a Pawn is only 1/1 in stats because it’s brave enough to stand in the way of any C’Thun no matter how big. This card is quite likely to make Control Warrior lists as it gives tremendous tempo on board against the current aggressive decks of Zoolock and Aggro Shaman that plague the ladder as well as make the cut in many players’ tournament lists. It also combos tremendously well with Brawl in a late game scenario where you need the highest probability of clearing your opponent’s side of the board in a pinch. 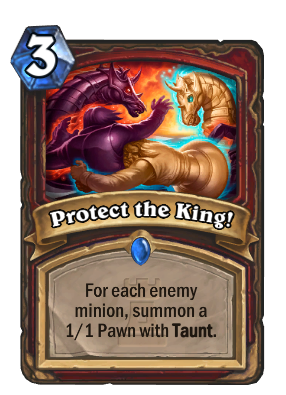 Although unlikely to make Bolster Warrior viable, Taunt is still of high value in terms of keeping control of the board and will likely be a double include in Control Warrior or even Dragon Warrior against a very early-game centered meta. Ivory Knight – Expectation Score 8/10. This has been, next to Firelands Portal, one of the most discussed cards in the set ever since Ben Brode announced the set two weeks ago. A 6 mana 4/4 might feel underwhelming in stats, but it makes up for it in giving you a targeted Discover mechanic as well as a heal, which is a premium luxury bonus in Hearthstone. A quick probability analysis gives us around a 65% chance of being able to Discover our way to at least a 5 Health heal which is pretty decent all things considered. In addition, many high-cost Paladin spells are also very strong in the late game and since Ivory Knight is likely not be played before turn 6, that’s another bit of good news. Avenging Wrath, Enter the Coliseum and Lay on Hands are all spells I would not mind getting in a late game scenario. If you run even a couple of Murloc Knights, Anyfin Can Happen can provide tremendous value once you’ve stabilized the board. 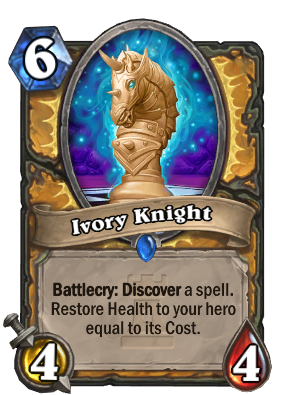 The main downfall of this card however, might not be because it doesn’t provide good value, but that the heal compared to other Paladin cards might seem underwhelming. Forbidden Healing, Lay on Hands and Ragnaros, Lightlord are just a few Paladin cards being run as a stabilizing heal in the N’Zoth Paladins we see today and Ivory Knight would potentially have to compete with those consistently amazing options. Cloaked Huntress – Expectation Score: 8/10. Is it Mysterious Challenger for Hunters? No… not really. It doesn’t pull Secrets from your deck and play them all for you. It doesn’t thin out your deck for other options later in the game. But it does let you painlessly drop a few Secrets to repair that Eaglehorn Bow. As a 3 mana 3/4, it has a solid body already and can easily compete with any other 2 or 3 drop in the game. 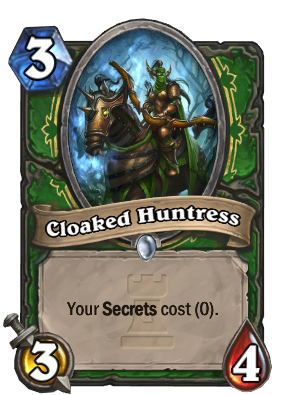 Will it trigger a new Secret Hunter deck? Probably not, but Mid-Range Hunter can definitely feel less guilty about keeping a few early Freezing or Explosive Traps and who knows how good the new Cat Trick Secret will be? 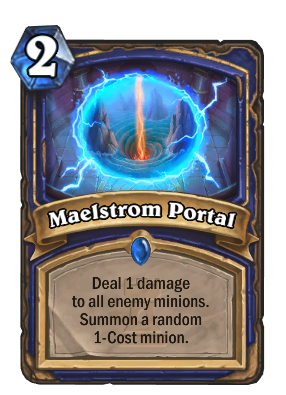 Maelstrom Portal – Expectation Score: 6/10. This card might be the reason Aggro Shamans will win over Zoolocks. Since Whispers of the Old Gods was released, those two decks vied for the top spot on ladder due to the consistently high win percentage as well as a fast game pace that made grinding up the ladder as painless as possible. Although speed of play isn’t a factor in tournament play, those decks are still a popular aggro deck choice in Conquest. With that being said, this card will still be an ace in the hole mulligan in that matchup for Aggro Shaman. With a lucky Wrath of Air Totem roll on a Hero Power, it can easily board clear a Zoolock and drop a 1-drop as a bonus. Personally, I’m looking forward to seeing if this makes the lists over some other more traditional options such as Lightning Storm or whether it would be used as a one-of. 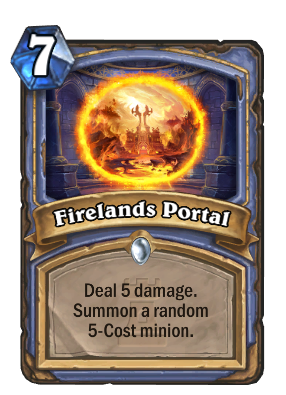 Firelands Portal – Expectation Score: 5/10. This card looks like it has potential. It is a large removal and minion in one. However, there are a few drawbacks. In general, the 5-Drop slot has a ton of Battlecry effects that dilute the minion quality of the 5-Drop that you receive as a result of this card. In addition, keep in mind that at the later stages in the game, a 5-damage removal does not mean nearly as much as it would on turns 4 or 5, especially in a high tempo meta-game that we live in. In the event that the game slows down as a result of this adventure, then it could easily make Tempo or Freeze Mage lists due to the high power and card advantage turn it could potentially give you. We all know Hearthstone is all about the Legendaries and a 30-Legendary deck is unbeatable… (*insert sarcastic face here*) However, that doesn’t mean here at the NUEL we don’t love all of our Legendaries for who they are. So without further ado, here’s our first legendary of the Adventure. Moroes – Expectation Score: 1/10. Okay… that doesn’t mean we rate them any differently, but our favorite steward still has a dear place in our hearts. He apparently also has a deep place in the hearts of the other Stewards in Karazhan as he calls upon another one every turn to help us in our battles while remaining out of sight himself. How good is he? Unfortunately, comparing his effect to Imp Master, it doesn’t look all that great. No current meta-game deck runs Imp Master, or is even close to considering it and he spawns Demons for potential Warlock synergies. This is mainly due to the incredibly slow pace of play of Imp Master and it simply does not provide enough Imps to matter. Moroes is the same way. He spawns his 1/1s at the end of your turn, allowing your opponent time to respond. 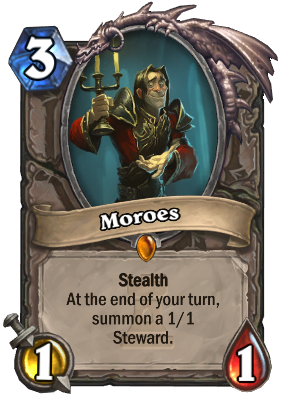 In addition, he only has 1 Health himself, making him an incredibly vulnerable target to any and all board clears. Fingers crossed that we see him played in the new Divine Shield Paladin decks? You’ve done the dishes, broken the Magic Mirror, and outsmarted the Black King at his very own game. Now it’s time to go to the Opera. Romulo and Julianne are waiting for you as well as the Big Bad Wolf and the Crone. Despite Medivh’s sudden disappearance, the show must go on and you must save it. Can you make it happen or will you break a leg (literally)? Best of luck adventurer and we’ll see you in Week 2 of our NUEL Summer tournament.